This is the next in a very long list from a Pokemon-obsessed Etsy customer of mine. Most of the pattern for Lycanroc (Dusk Form) was easy to come up with because I have done Mightyena for this same customer about a year ago. 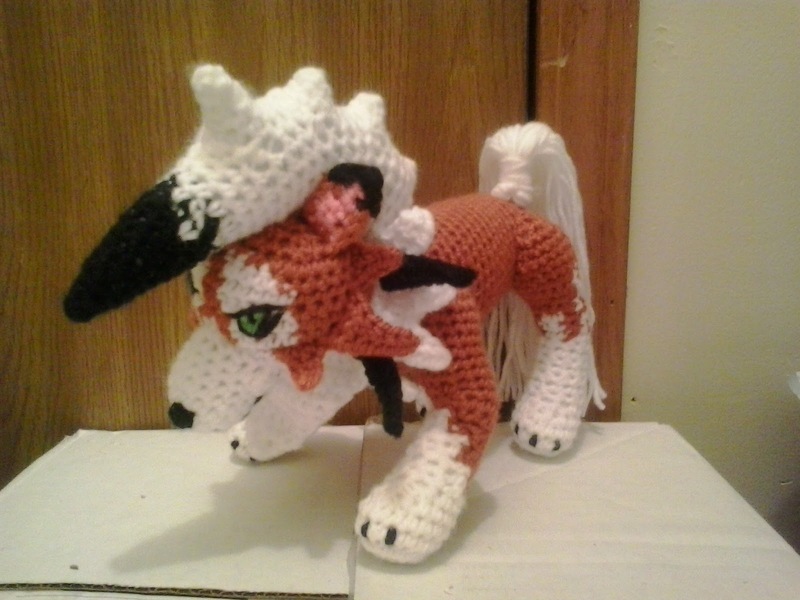 This pattern includes the color list for Lycanroc (Dusk Form) and Shiny Lycanroc (Dusk Form). Worsted Weight Yarn (Shiny alternative in parenthesis): White, burnt pumpkin (blue), black, perfect pink, and spring green. Finish off leaving a long tail. Weave tail through sc of Rd 30, pull tightly, and secure. Weave in ends. BEGIN STUFFING FRONT LEGS FIRMLY. CONTINUE STUFFING FIRMLY AT BOTTOM AND MEDIUM TO LIGHT AT TOP SO IT CAN BE FLATTENED. Finish off leaving a long tail. Weave tail through sc of Rd 24, pull tightly and secure. Embroider black toe nails on FRONT LEGS. Sew FRONT LEGS to BODY. STUFF LOWER PORTION OF HIND LEGS FIRMLY AND UPPER PORTION OF HIND LEGS MODERATELY BECAUSE YOU NEED THE UPPER PORTION TO FLATTEN. Finish off leaving a long tail. Weave tail through sc of Rd 26, pull tightly and secure. Embroider black toe nails on HIND LEGS. Sew HIND LEGS to BODY. Finish off leaving a long tail. Weave tail through sc of Rd 16, pull tightly and secure. Weave in ends. Finish off leaving a long tail. Sew MUZZLE to HEAD adding stuffing before closing. Embroider EYES, MOUTH, and NOSE on LYCANROC (DUSK FORM). Finish off leaving a long tail. Sew SIDEBURNS to HEAD. Rw 5: Holding INNER EAR and OUTER EAR together and working through both thicknesses, working in side of Rws, ch 1, sc in next 3 Rws, change to black, sc in next Rw, (sc, dc, sc) in point of ear, sc in next Rw, change to burnt pumpkin, sc in next 3 Rws. Finish off leaving a long tail. Sew EARS to HEAD. Finish off. Weave in ends. Stuff MOHAWK LARGE POINT firmly. Finish off. Weave in ends. Stuff MOHAWJ SMALL POINTS firmly. Rd 12: (sc in next sc, change to white, sc in next 2 sc, change to black) around. (12) Change to white. Finish off leaving a long tail. Weave tail through sc of Rd 31, pull tightly and secure. Sew MOHAWK BODY to HEAD. Rd 7: Ch 5, sc in second ch from hook, hdc in next ch, dc in next 2 ch, skip next 4 sc, slip st in next sc, (ch 5, sc in second ch from hook, hdc in next ch, dc in next 2 ch, skip next 3 sc, slip st in next sc) 3 times, sc in next 14 sc, slip st in next sc, (ch 5, sc in second ch from hook, hdc in next ch, dc in next 2 ch, skip next 3 sc, slip st in next sc) 4 times. Finish off. Weave in ends. Sew COLLAR to BODY. Sew HEAD and MOHAWK to COLLAR. Finish off leaving a long tail. Sew BLACK COLLAR POINTS to COLLAR. Fringe on pieces of white yarn. Wrap beginning of TAIL with white yarn. Lycanroc (Dusk Form), Shiny Lycanroc (Dusk Form) and Pokemon are copyright Nintendo. This pattern is an original pattern and is © by Christjan Bee (May 2018). Please do not claim this pattern as your own. If you wish to share this pattern, you may link to this pattern but please do not reprint it on your site. You may keep a copy for your own personal use but you may not sell or distribute it, or sell items made from this pattern. It is fantastic! And right on time: my nephew asked me to make this one too!! Thanks!